Bath salts have several nutrients and minerals, and as they dissolve in water quickly, they give you a refreshing shower/bathing experience. It is important to select the right types of bath salts while making sure they do not cause any allergic reaction. You also need to understand how to use bath salts properly. Keep reading to discover more about bath salts and their benefits. There are several benefits associated with the use of bath salts. Of course, you need to know how to use bath salts properly to reap maximum benefits. Before you go any further, you need to u nderstand that bath salts are processed and natural. You should opt for natural bath salts because they have all the minerals available to produce great results. Using pure bath salts will prove extremely beneficial for your skin. They contain minerals and several nutrients, such as magnesium, potassium, calcium, bromide, and sodium. These nutrients help make your skin look smooth. They also help eliminate any impurities in your skin, leaving a natural glow on it. Due to the availability of minerals, bath salts also give you a rich shower experience and help you relax as well. You may also get some health related benefits – they lower blood pressure and help treat muscle soreness. They are considered quite beneficial for treating problems like insomnia and itchiness. In order to get all-important benefits, you need to learn to use bath salts properly. It is no rocket science though. Simply fill the tub about halfway and pour a handful of bath salts into it. Hold your hand under the faucet to let the salts fall into the tub. This will ensure that the fragrance of bath salts combines with the steam and relaxes your nerves. Since the bath salts usually dissolve quickly in hot water, you may have to pour a couple of handfuls of bath salts before you soak yourself into the water. You can also use bath salts for exfoliation. For this, you need to take fine-grain bath salts and add some water to it to make a paste. Apply it over your skin and rub to make it look smooth and fresh. Do not extend your bath because extended baths can help with muscle soreness but may leave your skin dry. Keep it between 15 minutes and half an hour. Understand that bath salts are available in different sizes, colors, and textures. Colors may have an impact on your mood, so you may have to experiment a bit to find the color that suits your mood. Blue bath salts are effective when you feel anxious. Similarly, orange, red, and yellow bath salts will make you feel energized. You may want to avoid using bath salts if you have open sores on your skin. They can cause irritation. Avoid shaving in the shower when you are also using bath salts. People from every age group can benefit from bath salts, but you may want to avoid it if you are prone to allergies. It is also possible to find specific bath salts that may feel better even if you have allergies. Consult with your physician if you are pregnant and want to use bath salts. Make sure to store bath salts in a cool and dry place. There are a number of other ways to use bath salts. Here is more about how to use bath salts other than using it in shower or bath. You can use bath salts for a quick footbath. If your feet smell a lot, you may add Epsom salt in half-cup water and use it to wash your feet. This will make your feet smell fresh and even keep toenail fungus at bay. Repeat it thrice for the best results. Add some water to bath salts and turn it into a natural scrub. 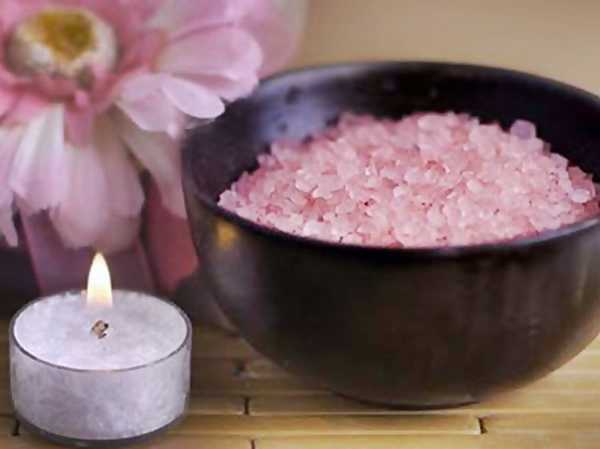 You can even give yourself a pampering spa treatment by adding ¼ cup of organic oil to bath salts. Epsom salt is a great choice if you want to make a warm compress to put on bruises. Get some salt. You can use Dead Sea Salt, Epsom Salt, or Pacific Sea salt for the purpose. Select a scent for your bath salts. Using essential oils is the best option. You can use one essential oil or mix a few to create a new fragrance. Just be sure to select oil carefully while making sure the fragrance and oil will not trigger an allergic reaction. Add some color. For this, you can use food coloring. Get a glass bowl and use spoons to mix the bath salt recipe. You can also add liquid glycerin to your bath salts to enhance their health benefits. Glycerin works as emollient and lubricant and helps keep your skin moisturized.